Performance Studies Focus Group is seeking proposals for our pre-conference, SPECTACULAR LABOR, to take place Wednesday, August 10, 2016, 9am to 7pm and Thursday, August 11, 2016, 8am to 12pm at a TBD location in the Chicago area. Our keynote speaker will be Joshua Chambers-Letson, Assistant Professor of Performance Studies at Northwestern University. We seek proposals for academic papers, live performances, and experimental formats. Proposals are due 4 May 2016. For more information, contact pre-conference planners Steve Luber and Jasmine Mahmoud, sluber and j-mahmoud. 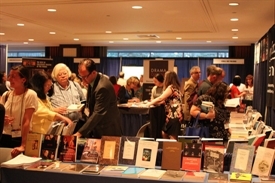 Announcing again, VASTA’s 30th annual conference, Dynamic Dialogues and Connections, to be held in Chicago, on August 8 to 11, 2016. Our conference directly precedes ATHE’s, so members from both organizations can enjoy a dynamic variety of panels, workshops, and speakers. Visit our website for the exciting offerings from featured presenters at www.vasta.org. Also this year, many of our sessions will be eligible for Speech-Language Pathology CEUs, so connect with your colleagues on the science side of the professional voice to spread the word. Based on Acting and Singing with Archetypes (Rodgers and Armstrong, Limelight Editions), this innovative work uses mythical and legendary journeys as the basis for opening doors to unexplored vocal, physical and imaginative expression. In addition to the journeys, participants will apply the discoveries to text and explore ways to integrate the work in the classroom. Participants will receive 40 hours of training with six certified university teachers. Certification in the work is available. For more information, visit JanetRodgers. As educators, scholars, and artists, we work in a variety of formats, so we invite proposals for a variety of presentation formats, including (but not limited to) presentations, workshops, round-table discussions, panels, or performances. Following significant discussion and interest at the 2015 ATHE conference, the theme “Directors’ Work: Directing Alternatives to Psychological Realism” emerged. This Pre-Conference seeks to offer a venue for participants to share, question, and engage with strategies, methods, issues, and questions surrounding the work a director undertakes when approaching texts and productions that move beyond traditional psychological realism. These styles – whether they be in regard to Brecht, Beckett, devising, and others aesthetic modes – often require the director to approach a text differently, and this Pre-Conference seeks to explore those approaches. Listing in conference mobile app, with link to website and contact information.